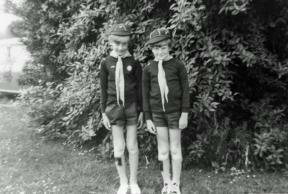 At the death of my Grandmother In 1955, at the age of 13 I came to live with my Mother and Step Dad Bill Weeks, at Priory Cottages, Woodcutts, having previously lived in Alderholt where at the age of 11 I joined the then newly formed Scout Troop, at the time of the move I was very upset, not about the having to move to Woodcutts but at having to leave Scouting which I was enjoying very much. 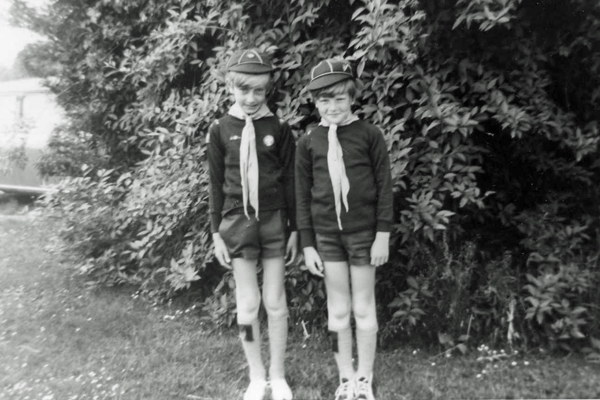 On starting School in Sixpenny Handley, one of the first things that I did was to enquire who was the Scout Master here, only to be told that there wasn't any Scout Troop, after a few days of my juvenile thoughts, I decided that the only thing to do was to start my own Troop, (how naive), I started talking to the boys of Scout age (girls weren't allowed in Scouting in those days), I managed to find 5 who were interested in joining, this was great as this meant that we had our first patrol which was subsequently named the Wolf Patrol, I then wrote to my old Scout Master Sid Raison to tell him that I wanted to start a scout troop and that with myself I now had a patrol of 6 and could he come over once a month to test us on what we had learnt. 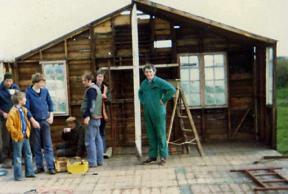 He wrote back to say that he would do his best to help ( he was a wonderful man and without his help we would never have got off the ground), he obtained and sent me all that was needed to get going. 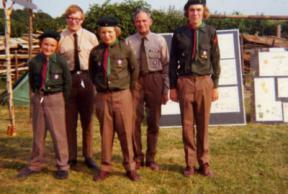 At our first meeting in my Step Dads coal shed, Ray Churchill, Chris Bagg, Michael Maidment, Chris Day and Ian Adlem began to complete, under my instruction their Tenderfoot Badge ( we are still all in the land of the living and at our birthday celebration on the 1st of July I hope that we can all reunite for the day), at the end of the month Sid turned up on an Auto Cycle which was part motor bike but on the flat, when you went up hill you had to peddle like mad, this he did for the next month by which time my first five scout were ready to be invested, Sid had to get permission to this from the then District Commissioner, Jimmy James who was based in Wimborne, to which he agreed, providing we became a part of the Alderholt Troop, this we continued to do for the next two years, incidentally during this time we had added another 6 youngsters which were to be known as the Stag Patrol, during this time I continued to instruct them on Scouting skills and Sid religiously came over once a month to sign off what they had learnt. 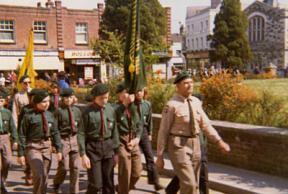 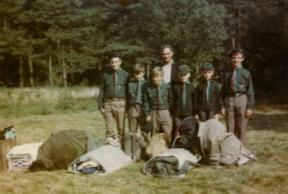 In 1957 we were to become a Scout Troop in our own right, 1st Woodcutts. 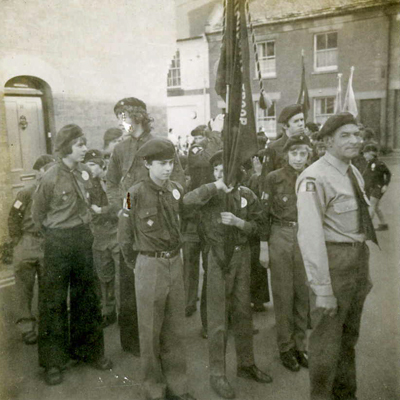 At the end of 1956, John Curd who was a nephew of My Step Father, offered to become Scout Leader, after going through all of the appointment process he received his warrant, during this interim period, Jimmy James Wimborne District DC, held a meeting of interested parties in the local School, he was hoping to form a Committee to support Scoutmaster John Curd and to raise funds to help buy equipment and pay for activities, at this meeting George Tozer agreed to become Chairman, Les Bagg Treasurer and Jean Woods secretary, committee members were Miss Hooper ,Miss Blythe (relative of Blythe of the Bounty) Mrs Churchill ,Mrs Maidment and my Mum Betty Weeks, this enabled 1st Woodcutts to become a Scout Group in its own right and so on the 8th of March 1957 1st Woodcutts Scout Group was formed and we began meeting in the old War AG Nissen Hut on Handley Common, this of course is still where we still meet but in a much more salubrious building, prior to that and after we had outgrown the coal shed, we would meet around a flag pole on Woodcutts Common at our first meeting at this site, we stood around the flagpole Mr Medway who had been one of Baden Powell's original Scouts on Brownsea Island in 1907, presented us with our first union jack and scout prayer book , in the Winter by permission of the Landlord we were lucky enough to be able to use the old hall at Farnham which was a part of the Museum Hotel but not as it is now, part of the hostelry. 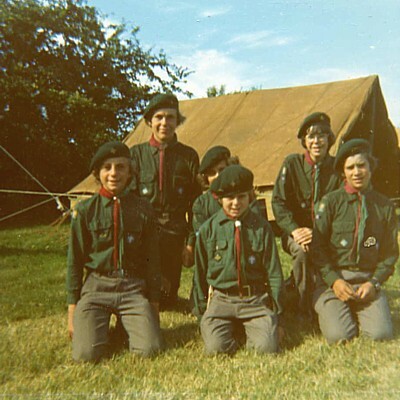 After two years John Curd decided that scouting was not for him, we were having a Christmas party in the old hut when he announced that he had, had enough and flounced out, Jimmy James had been speaking to one of the Parents whose son Chris Hardiman had recently joined the scouts, Gilbert, (later to us Scouts he was to be known as Skip Bert), Gilbert, we found out later had been a Scout in Wimborne when Jimmy was the Scout Master there, anyway after John Curd left, Jimmy spied Bert across the room, he bellowed out , Gilbert, I have got a job for you and so Bert became our next Scout Master and in later years he became our first Group Scout Leader,( Bert and I became firm friends and were so right up until his unexpected death), shortly after this a Cub pack was formed, Bert's wife Kathleen Hardiman was Akela and Miss Cook was Baloo, I can remember two of the first Cubs, they will be known to you as current Village residents, namely, John Clarke and Steven Judd. 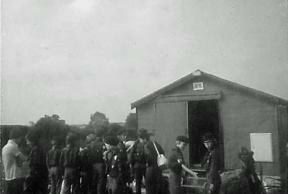 The summer camp was and should always be the highlight of the year, I can remember many happy camps, Brockenhurst, Charmouth, two at Studland, Chideock, West Bay on several occasions, Beer, Valonges in France, two visits to the Netherlands, Wales, Scotland ( this one was memorable for the midges), several camps on Guernsey but the one that stands out for me was the one at Eype, we camped in a field adjacent to the cliff and of course below was the sea, we cut steps in the cliff and draped a rope down over giving quick access to the beach, our drinking water came from a spring in the middle of the field, the farmer had surrounded this spring with concrete, this was also the drinking place for the cows so you can imagine what else was up close to the spring, we had to boil all of our water whether for washing or drinking, this was one of the happiest camps that I can remember, in the early days we used to put our kit and equipment into the back of Moreys Gravel Lorry and then all climb in and sit on whatever piece of soft kit we could find, either Harold Churchill or Maurice Gulliver would drive the Lorry, Moreys never made a charge for this, thinking of some of the things above, it was a good job that there wasn't Health and safety in those days, incidentally, one of my old Scouts and now my brother in law Peter Perry visited the old Eype site about 10 years ago and we were pleased to see the spring watering hole was still in use. 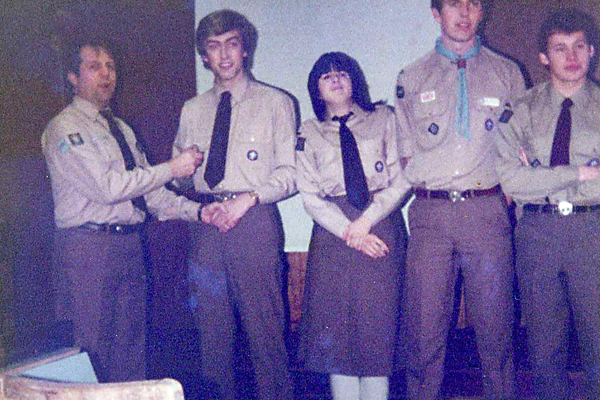 Following on from scouting being reorganised by National Headquarter, a new section was formed this was to be known as Venture Scouts and could be of mixed sexes, age group 16 - 24, Bert Hardiman and myself discussed this and despite his reservations at first, we decided that if we could find a Leader we would give it a go, Tony Dale who was a Sergeant in the Wiltshire Police and lived at Woodyates had recently joined us a an assistant Scout Leader and when living at Verwood had been a Youth Leader, this was one of the reasons that he decided that he would give Venture Scouting a go, Kevin Prince who had been a Scout in his younger life volunteered, or was press ganged into becoming Assistant Leader, Simon Meaden was just coming up to sixteen and was keen that we should set this unit up, we tasked Simon with finding at least 6 – 12 other young people of the right age group, this he did in no time at all and so Venture Scouting became a place in 1st Woodcutts history, the unit went on to be very successful, during its time they had many Queen Scouts and also some Duke of Edinburgh Gold awards, unfortunately when Tony decided that it was time to hang up his woggle, despite attempts to keep it going, it eventually folded,( recent years has seen this section revived under another banner its now known as Explorers (14 – 18) and of course Woodcutts has a unit). 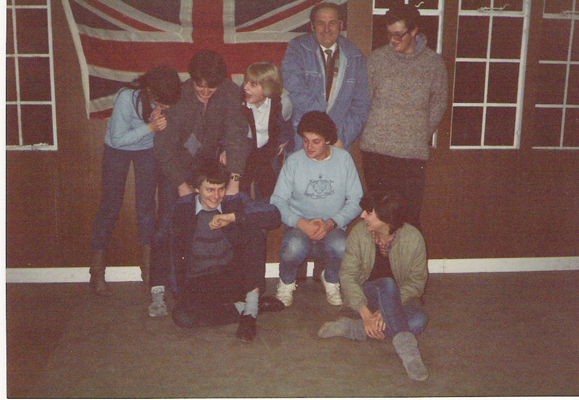 Bert became ill with heart problems but despite this setback he continued in his role as Group Scout Leader, I can't recall the date but the memory is etched in my mind for ever, just before Christmas we were having a party at the Hut and Bert became very unwell and had to go home, after the party I went down to the Star for a drink, whilst there Elaine Metcalf came through to the bar asking if anyone had seen Chris, Bert's son , something told me that I must go to Chase Crescent where they lived, instead of driving up the High Street, I drove via Back Lane, as I approached the junction opposite the school, I had to wait as Richard Adlem was reversing out into the Lane in his van, I followed Richard to Chase Crescent and assisted him in his duties, Bert had passed away, as you can imagine I was pretty cut up and didn't want to be alone, I made my way to Edmonsham to the home of Bob Lewis , who was our Scout Leader, he was waiting at the door, he had heard me arrive,( he didn't know about Bert's sad passing ) His first words were, I have been expecting you, It had been just one of those nights, how did he know, Bob and I sat at his dining table until day light, we started with a full bottle of scotch, you can imagine, it was sitting there empty in the morning light, I had witnessed a similar experienced once before, during the Falklands Campaign one of our ex Scouts, Martin Isaacs was on board HMS Coventry when it was sunk, we were at Camp and Bert came to me and said, Martin is in trouble, a freeze has just gone down my spine, we were to find out that Martin had ended up in the water and had to be rescued , fortunately he was fine. 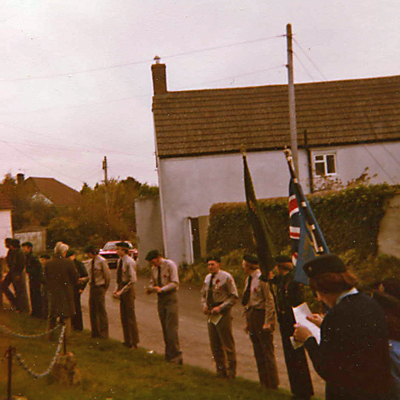 Leaders form the Group were asked to be bearers at Bert's funeral ,this we carried out with sadness but with pride, I had lost not only one of our family of Leaders but also a great friend as well, Bert played a significant part in our history and will never be forgotten, sadly Bob Lewis has also passed away together with a past assistant Cub Scout Leader, Peter Bantges, it comes to us all in time. 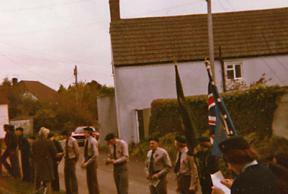 I moved on to hold various roles in the District and had little involvement in the group for a number of years but had been made an honouree Vice President, fifteen years ago the Group was in danger of folding, a young man, who was to play and has to played a significant part in mine and the Groups future and fortunes arrived in the Village, Rob Easton together with Claire Wife, on hearing of the Groups plight he offered his services, he offer was swiftly gobbled up, at his first meeting he had three Scouts. 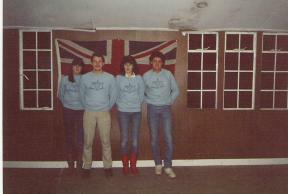 In the late 80s I was appointed to a District Role which meant that I had to give up my position at First Woodcutts, I was succeeded by Barry Howe's and subsequently, Roy Warner, during this time I lost touch with the day to day running of the Group, though through the grapevine I was made aware of how things were going. 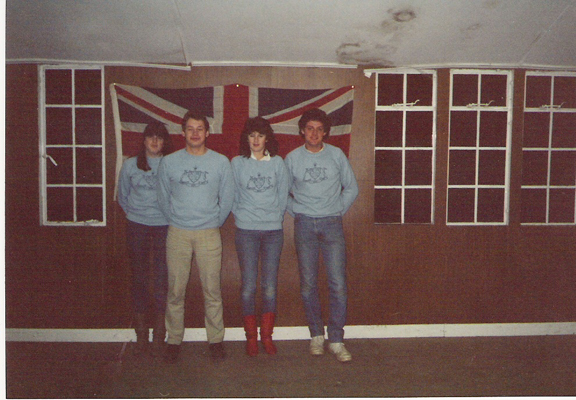 1985 - Inside Scout Hut. 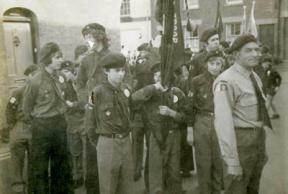 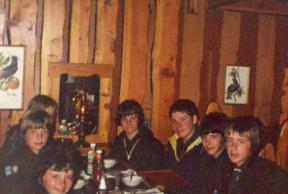 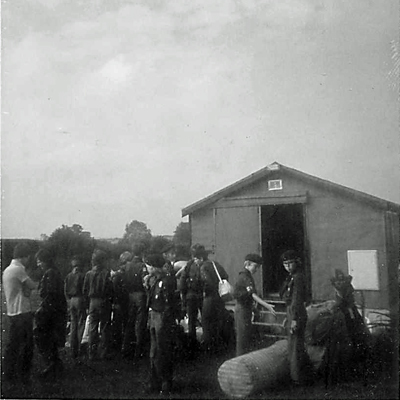 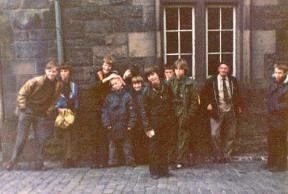 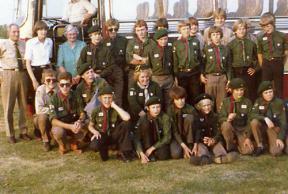 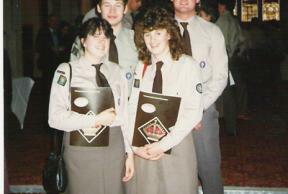 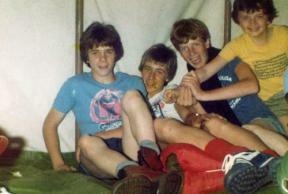 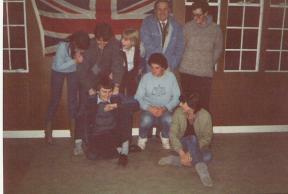 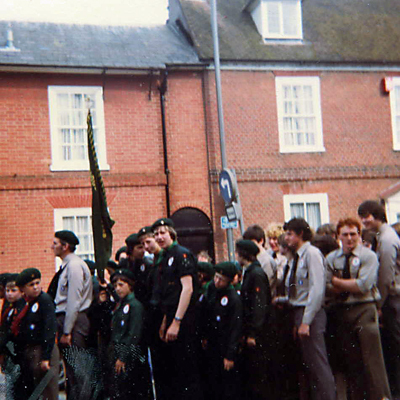 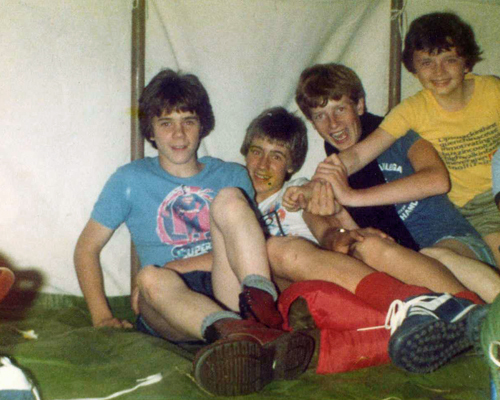 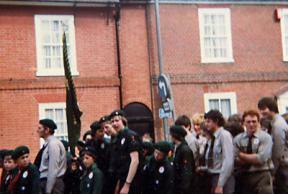 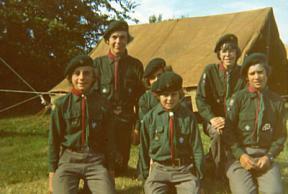 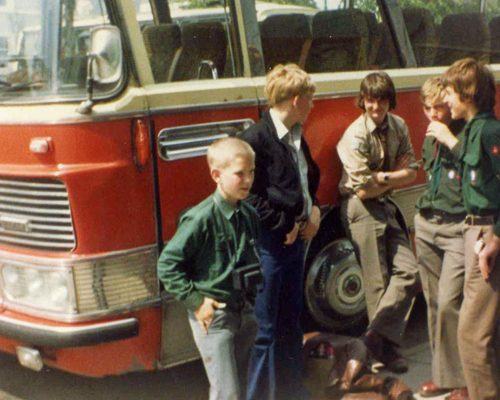 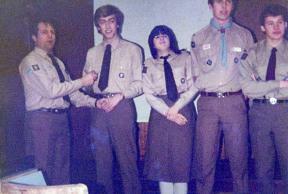 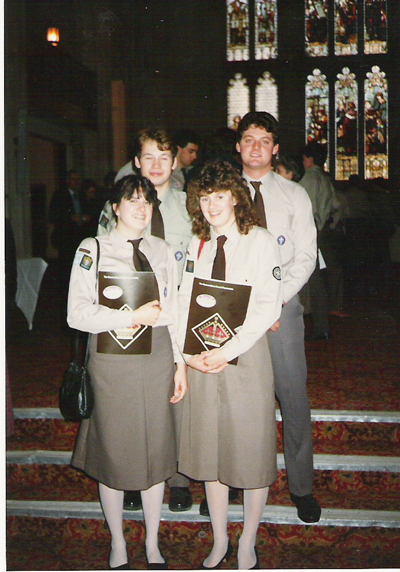 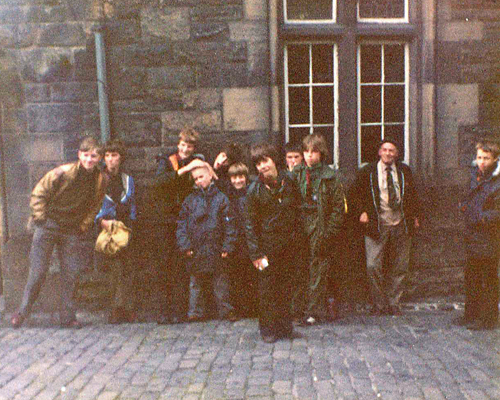 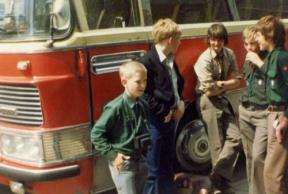 1985 - Venture Scouts in Scout Hut. 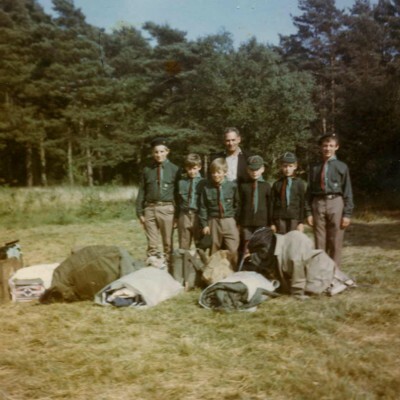 In 2000 Rob and Claire Easton who were new arrivals to the village, heard that the Group were in need of a Scout Leader, Rob volunteered, what an inspired appointment, he inherited 3 Scouts and I believe that there were only four Cubs being looked after by the then Akela, Esme Isaacs, soon the troop began to grow again and the offshoot was that the Cub Pack also began to swell, all it takes is to get someone in who is enthusiastic and full of new ideas and off you go, of course Rob is still with us and he has around 34 youngsters in the Scout Troop at this time. 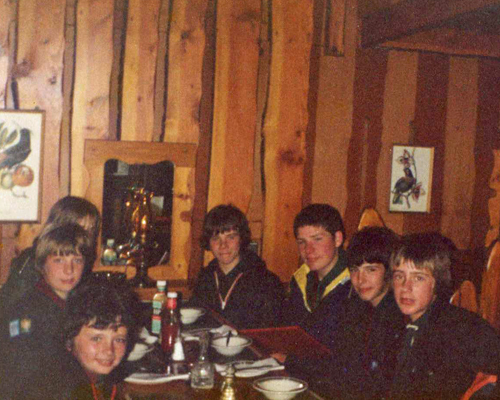 In 2005, Simon Meaden who was one of my old Scouts and now having children of his own in the Group had joined the Group Committee and was in charge of fund raising, Simon came to me to say that Woodcutts badly needed a Group Scout Leader to take some of the admin burden off of Rob, how could I refuse, I resigned from my District role and returned to the fold, one of the first things that I was keen to do was to start a Beaver Colony, we put up notices around the village and in the School asking for interested parties, both Parents and their offspring to attend a meeting in the village hall, to my surprise 10 - 12 families turned up, I had arranged for a District Beaver Leader to attend, she and my wife then proceeded to run what would be a normal Beaver evening, whilst the young people were enjoying themselves, I took the Parents off to the Pavilion for a separate meeting, my purpose of course was to ask for volunteers to run our Colony, I asked if anyone was prepared to become the Leader, for a while nothing moved and then, Denise Turners hand literally shot into the air, she said afterwards that it was as if a magnet was drawing her hand upwards, two others volunteered to be her assistants, Jill Hutchins and Andy Young, and so our Beaver Colony was born. 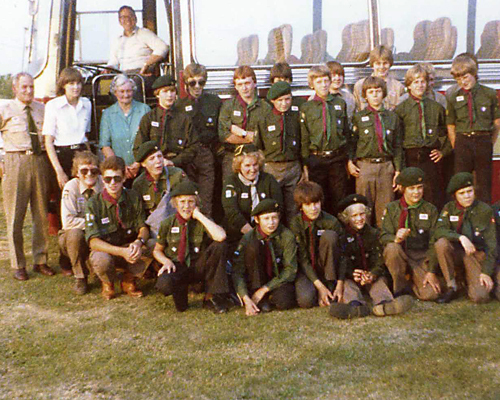 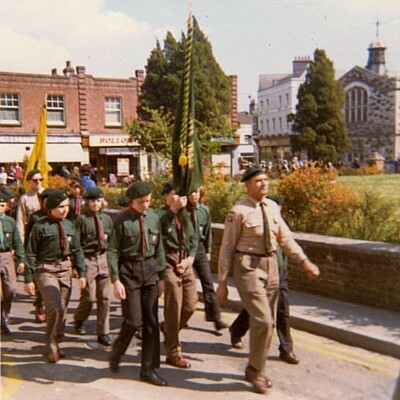 The Scout Troop had continued to grow and some of the scouts were now of an age when they had to leave, we and they were keen not for this to happen, a discussion ensued and Any Turner said that he would have a go at running an Explorer Unit (14 – 18 year olds) and so the Explorer Unit was conceived. 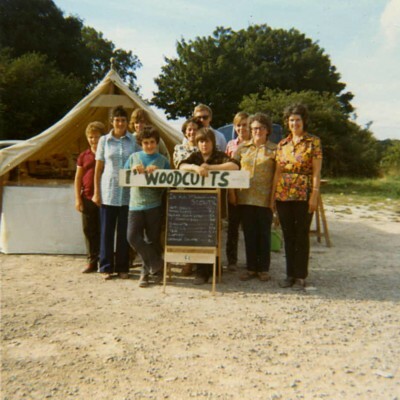 10 years ago Woodcutts celebrated their 50thyear, a celebration was held, much like the one we are intending to hold this year, a group photo taken and on counting up, fittingly there were 50 members present. 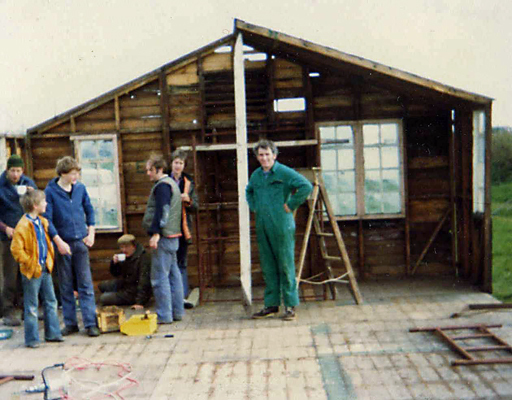 Six years ago thanks to the generosity of several people but mainly to Richard Adlem finance and Chris Hardiman who freely gave his time as our project manager, together with grants and money raised by the Group, we moved into our purpose built Headquarters, we are so lucky,( In the old building we always had new recruits as on numerous occasions the rats would poke their heads out of the holes in the floor), since moving into our new HQ First Woodcutts has nearly doubled in size, We have the capacity of young people wishing to join Scouting to be able to start another Beaver Colony, Cub Pack and Scout Troop, but despite appeals, we are unable to find anyone wishing to become Leaders and so these young people are missing out on the wonderful world of Scouting. 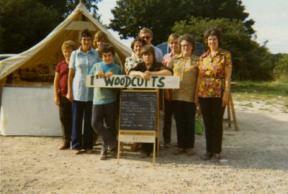 I feel very proud and honoured to be part of this fabulous group of people, it was run as a family when we started back in 1957 and it is still a family today. 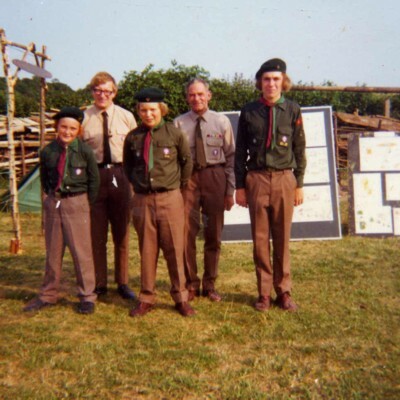 I would now like to say a big thank you, Skip Hardiman, past Chairman and President George Tozer Scout Leader Bob Lewis and assistant Cub Scout Leader Pete Bantges, all sadly gone home as we say in Scouting, Denise Turner and Andy for running, until your retirement wonderful and successful units , to all past Leaders /Committee members who were part of our Family so to speak, Toby Cullen who has just relinquished his role as Chairman, our past stalwarts, Treasurer Alistair Broadway who together with finance raiser Simon Meaden put the group in the fine financial position that we find ourselves in today and lastly the current Leadership Team and Committee, I don't normally single out any Leader for praise but I must mention Rob, he motivates all of us, from our youngest Beaver to the oldest person, which is myself, I must mention our community, thank you, you have always supported us during our 60 years, lastly I mustn't forget to mention the young people, because without you we would all be out of a job.